Dizgraceland: Where are you when we need you Harold Camping? 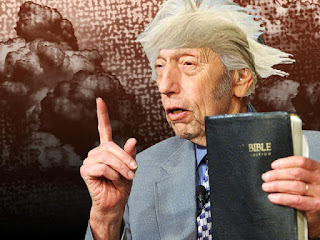 When Harold Camping, serial predictor of the end of the world, died in 1993, I lost a great deal of blog material. The pompous, bible-thumping windbag was the poster child for self-righteousness. And even after wrongly predicting the rapture three times, he still managed to reel in followers to his religious right. He was a champion huckster. Now who does that remind me of? Why Trump and his basket of deplorables, that's who! I imagine Harold and his cronies would have been right there in the basket suggesting that Trump was finally going to fulfill the prophecy and bring about the end of the world. This time he may have been right. I have never seen the country so polarized before. It's like something out of Stephan King's end of the world novel, The Stand. Trump is the Dark Man rallying the haters around his dark tower in Las Vegas. And they are all crawling out from under the rocks they've been hiding under, gibbering like idiots at his jibba jabba. There is no reasoning with a Trump supporter. You simply can't fix stupid. I cringe every time I hear one of them gush about how Trump is the only one who speaks up about the things they believe in. They can be dirt poor, toothless Walmart fashion plates and they'll swear Trump is the only candidate who they can relate to. Doesn't matter that Trump is a self-proclaimed billionaire who was born into money. Doesn't matter he has never been anything other than a white collar moneyed class elitist. They relate to him because he speaks their language. And it is unintelligible to anyone with more than a grade school education. I haven't really been this disgusted with the country since George W. was elected because of some dimpled chads in Florida. But as simple minded as George W was, I don't think he was evil the way Trump is. And his supporters were just simple minded (and greedy) Republicans. They were this rabid pack of carnival geeks. If Hunter S. Thompson hadn't have already blown his brains out I think the rise of Trump would have been the the final straw. Even Nixon (the bane of Thompson's existence), evil as he was, was at least smart. And he was experienced. Trump has never held any office. He has simply bullied and blustered his way through life. But his followers are blind to all that. Just like Harold Camping's followers who drained their bank accounts in anticipation of the end of days. I imagine they are all wearing "Make America Great Again" hats these days.